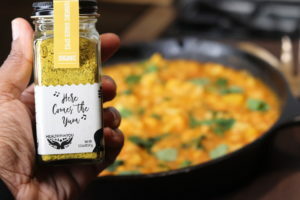 Some days when your body is feeling low and you just need a to show it some love, this delicious and nutritious vegan curry is designed to get you back on track. Its a perfect detox meal because not only is it packed with nutrients,, but this meal can take you into the week with leftovers for lunch and even freezer meals if you double it. 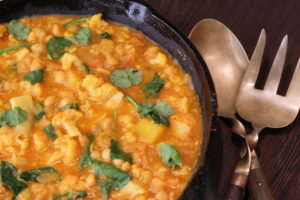 The cauliflower, chickpeas and Kabocha squash (Japanese pumpkin) are high in fiber, beta-carotene, iron and vitamin C. Another bonus: if you leave out the brown rice, its the perfect one-pot meal, limiting your time on clean up duty! Truth is, I love a good curry and this one is relatively easy and doesn’t require any fancy kitchen devices or tools; just a knife. cutting board and a basic cast iron pan. Enjoy! In a cast iron pan, heat the grapeseed oil and add the diced onions and cook over medium heat for 2 minutes until the onion is translucent. Add the garlic and ginger to the pan and cook together with the onion for one minute, continuing to stir. Add the Healthy On You®Here Comes the Yum/Turmeric Ginger spice blend and smoked paprika and saute for one minute until fragrant. Add the tomato paste, chopped tomatoes, broth, coconut milk, kabocha squash, cauliflower, and the cayenne pepper. Bring the stew to a low boil, reduce the heat and let simmer for 35 minutes. Top the cooked brown rice with the curry and garnish with cilantro and serve hot.